Congressman Harold “Hal” Rogers (KY-05) commends Leslie County High School Principal, Kevin Gay, for his selection as a Champion of Change by the U.S. Department of Education and the White House for leadership in his community. Principal Gay, his faculty and staff have consistently shown their dedication to the students of Leslie County, demonstrated by dramatic, positive changes in a persistently low performing region and vast improvements in student outcomes. On Tuesday, August 21, 2012, Principal Gay was honored at the White House School Turnaround Champions of Change event where he was joined by 11 other educators from across the nation who have made a positive impact in their communities. 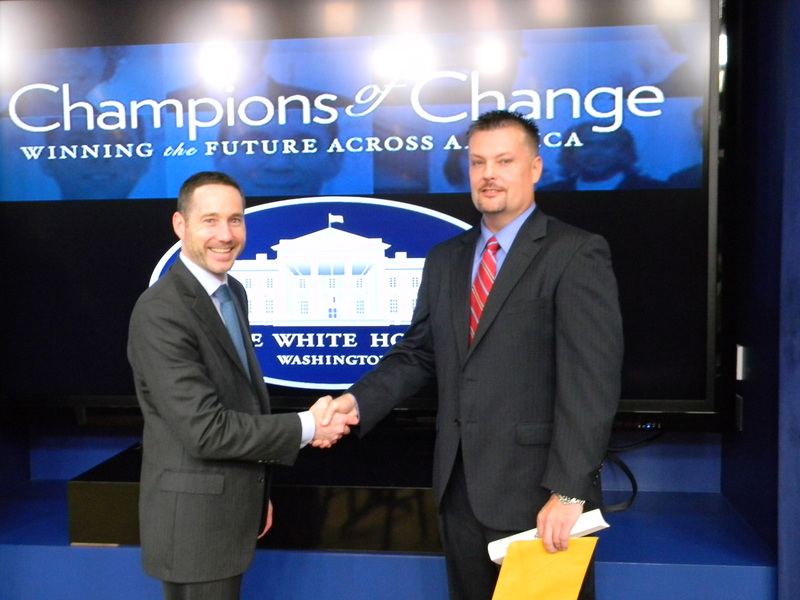 Photo Cutline: Principal Kevin Gay (right) pictured with Jason Snyder, Deputy Assistant Secretary for Policy and School Turnaround (left).